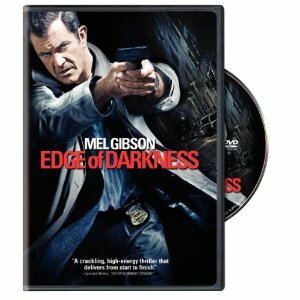 Just got done watching the new Warner Home Video DVD of Edge of Darkness, the 2010 paranoid conspiracy/Boston cop thriller starring Mel Gibson and based on the highly regarded 1985 BBC mini-series of the same name. I missed this one in the theaters (as did most people, actually) but while I've been as befuddled by Mel's recent public behavior of late as the next guy, I have a sort of sentimental fondness for him and I'm still inclined to give him a break. More to the point, given that this one is co-scripted by William Monaghan, who did an exemplary job adapting a Hong Kong action thriller for Scorsese's The Departed (another film set in Boston), I figured it might be worth a look. You know -- how bad could it be? Boston cop Thomas Craven (Gibson) is hosting his emotionally distant daughter on a rare visit home, when suddenly she's gunned down in cold blood on their doorstep. Because the gunman shouted "Craven!" and because a cop makes enemies, Tom assumes his kid took a bullet meant for him, but as he looks into her life, he discovers she'd been preparing to turn whistleblower on her employer, a corporation doing unsavory secret things for the government. Involving nukes. Oops. After that, Craven gets deeper and deeper into a shadowy world where money and political intrigue intersect. And suddenly there's a target painted squarely on his forehead. Scary!!! Here's the trailer to give you a little taste. Anyway, the answer to our earlier question is -- not that bad at all, actually. Director Martin Campbell (who also did the original BBC version and, more recently, the entertaining Casino Royale) helms the thing with a refreshing old fashioned straightforwardness (none of the currently de rigeur endlessly circling camera or any of that quick-cutting crap), the story is reasonably engrossing, and co-star Ray Winstone is slyly amusing as a philosophical government agent who may or may not be one of the bad guys; the film's energy level picks up noticeably every time he shows up for a scene. As for Mel, let's just say that although his pretty face is going to hell, he's quite convincing here as a stolid older action guy in the Charles Bronson mode. The bottom line: A diverting two hours, if not remotely in the same league as its obvious inspiration, Alan J. Pakula's 1974 The Parallax View; you can -- and on balance, it wouldn't hurt you if you did -- order it over here.